Yes, there really are grants for nonprofit organizations of all missions, budgets, and ages. Folks from nonprofit organizations of all types frequently tell me “We are not able to find grant funding because we are too small, too big, too rural, too urban, too international, too young, our mission is too unique . . .” You get the idea – and the bad news is, they are not wrong – many grantmakers are very specific about which organizations are eligible for an award. However, the good news is that there are more and more grantmakers actually focusing on funding the work that organizations like yours accomplish. And there are a myriad of grantmakers who will support organizations during all facets of their growth cycle, from new, small-budget nonprofit organizations through very mature, large-budget organizations. The trick is to apply for funding from the grantmaker most likely to fund your type of organization. Yes, there really are grants for nonprofit organizations of all missions, budgets, and ages, but they are not always easy to find from Internet searches. It helps to know what type of funder is most likely to offer support for your organization. 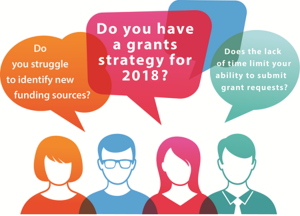 According to the Spring 2018 State of Grantseeking™ Report, for example, a nonprofit under five years of age with an annual budget less than $100,000 and a mission focus on youth development in a rural service area might want to start its grantseeking by speaking to local groups including religious organizations, the United Way, donor-advised funds, and civic organizations such as the Elks, Lions, or Moose. Whereas, a mature organization over 50 years old, serving an urban area, with a $5,000,000 annual budget and a human services mission focus might better invest their time applying for state and federal grants. We suggest that you use a high-quality database, such as GrantStation, to do your research. Having access to a database that provides the ability to search using specific criteria, including where you are located, will save you so much time. And, GrantStation only profiles funders that accept unsolicited letters of inquiry or full proposals, so you don’t hit a bunch of dead-ends. Why does that matter? Well, funder endowments and investments were reduced during the most recent recession, and as a result many grantmakers became “closed shops” that offer awards by invitation only. In these cases, unless you know someone on the grantmaker’s board or staff, your letters of inquiry will not be accepted. GrantStation has already weeded the closed shops out, ensuring that your letter of inquiry will be given consideration. The US Charitable database features private grantmakers, including independent, family, community, and corporate foundations; corporate giving programs; faith-based grantmakers; giving circles; and other associations with a grantmaking program. With nearly 7,000 grantmakers listed that accept unsolicited requests, there are funders with interests in most missions. You can focus your search to find grantmakers that are right for your organization and programs by choosing geographic scope, areas of interest, target populations, types of support, type of grantmaker, and the location of grantmaker. The US Federal database can be a good source of funding for established organizations, or for organizations that can collaborate with other nonprofits. You should not limit your searches based your main mission; look at your various individual programs, or even beyond your core mission. If your programs benefit the larger community beyond your mission, you may be eligible for additional program funding. As many organizations have an international reach within their programs, the International database cuts through confusing information and offers succinct grantmaker information. As you can see, GrantStation databases are rich in opportunities for organizations like yours. Unsure? Check our Member Benefits, or email our Member Services staff to learn more about GrantStation. In Summary: Are You Ready for Grantseeking? Before you dive into searching for grantmakers, review all the steps for effective research. You can focus your grant research by completing the Project Description Worksheet we offer on the GrantStation website. This is a simple Word template where you describe your project and the needs, itemize your budget needs, and indicate your best search criteria. Then you are ready to begin your research. GrantStation offers detailed, step-by-step tutorials on all facets of the grantseeking process. Our overview includes a list of the steps involved in writing a grant proposal. We believe that an annual GrantStation Membership, with its detailed step-by-step tutorials, rich grantmaker databases, and numerous other features will be your best tool for grantseeking success. Make sure to join GrantStation when Good360 offers a special two-day sale of annual Membership to GrantStation.com for only $119, a $580 savings off our regular price, on Tuesday, June 12, and Wednesday, June 13, 2018.